Grants from the fund are dedicated to enabling others to have the same opportunity, now and forever. The donor had a single goal: to ensure future residents would enjoy the community’s many assets as she and her family had. It only made sense then that the first grant, in 2012, went to Dundas Community Services to reach out to the town to determine its highest needs. Focus groups, a community open house and an online survey pointed to priorities that included resources for seniors, accessibility for those with physical disabilities, poverty reduction, envi­ronmental education, youth engagement and access to the arts. As a result, these became the focus areas for the Dougher Community Fund. Since this review, the fund has supported 15 projects, including playground naturalization, family art days, restoration of the Desjardins Canal, an information program for seniors, a youth centre and an assistive devices program. 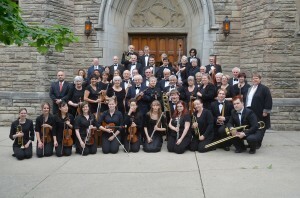 This year, a grant to the 36-year-old Dundas Valley Symphony Orchestra will help its music reach new ears. “We want to attract a broader audience and expand our repertoire by con­necting with choral groups,” says president Olga Hencher. The grant will be used to hire vocalists and coaches, purchase music and pay for addi­tional rehearsal space to prepare for the group’s annual lineup of six free concerts. Another grant is providing a part-time community garden co-ordinator for four Dundas affordable housing sites. “We want to increase food security, reduce isolation and build capacity among Dundas residents, especially seniors,” says Matt Bowen of City Housing Hamilton. “A staff person is critical to getting the project off the ground in a way that meets tenants’ needs and is sustainable.” When the project wraps up this fall, tenants will have a how-to handbook, a cookbook and connections with other food security programs, such as the Good Food Box, to see them through until the next growing season. With its “forever focus” on the quality of life in Dundas, The Dougher Community Fund is a textbook case of helping people give in a way that has meaning to them and impact in their community.